I had so many people ask me questions about how “My Thistle Garden” quilt was created that I am going to do a series of posts about how machine embroidery applique is done. When I started doing machine embroidery applique (MEA) on an embroidery machine, my goal was to be able to applique/embroider large blocks which held applique scenes made up of many, many applique shapes. Doing this kind of work requires many separate hoopings to applique/embroider various parts of the block. It was essential that I had a consistent/reliable system to ensure that everything would match up from one hooping to the next. The way I achieve is that I never actually hoop the fabric block itself. Instead, only the stabilizer is hooped and then the fabric block is “floated” on top of the stabilizer after being placed in a very specific position on that stabilizer. That “very specific position” is determined by registration marks/guidelines that are stitched directly onto the stabilizer as well as markings that I make on the fabric block. To illustrate this, I’m going to show you the steps involved in appliquing/embroidering a single applique shape that is positioned in the dead center of the fabric block. I’ll be illustrating this with the heart design above, which can be found as a downloadable file from our online store which can be found by clicking here. Of course, the glue side is facing the fabric. I cover this w/a pressing cloth (i.e. a piece of muslin), then spritz it with water. I then use a dry iron and fuse the interfacing to the back side. The block is now stabilized! Step 3: Hooping-Hoop 1 layer of medium weight cut away stabilizer onto your hoop. You can find my favorite cutaway stabilizer for MEA by clicking here. Place the hoop onto your machine. Step 5: Aligning the fabric block on top of the hooped stabilizer-You are going to use 2 types of straight pins for this step and they are both shown in the photo below. The lower pin, the one that has a truly flat head, is very important. Don’t try to skimp here and use something with even a small head; it really needs to be a flat-headed straight pin! The second pin, the one with an extra long shaft and a small ball at the tip, is optional meaning you could substitute many other pins for this one. Just cut away the stabilizer from the backside, and you’re done! 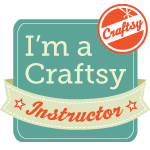 So this first lesson taught you how to applique/embroider a single applique shape onto the center of a fabric block. This is very basic (and very easy) but it is the first step in learning how to control placement of shapes on a block. Stay tuned because there will be more to come! Thank you so much for taking the time to do this, Patty!! Great machine embroidery lesson. And what a beautiful design too! Love it! Thank you so much. The foam to anchor the pin is brilliant. This is just what I need, you are a master at explaining things. Thanks so much! This is the first time I can really say the lightbulb came on for me. You are a true teacher. Thank you, I’m looking forward to the rest of the tutorials.